We've read about "brain death" being the point of no return in humans, but what is it in botany? 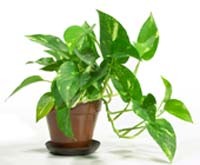 For the sake of this thread, let's only consider typical house plants, perhaps specifically, those classic vines people keep in offices. Specifically, we've all seen yellow leaves that eventually fall off a plant. Yellow leaves seem to have passed the point of no return — that is, I've never seen a yellow leaf "revive". Is it correct to assume that the green in a leaf is its chlorophyll? So, what causes a leaf's point of no return? Is it that a dead/dying leaf cannot maintain its chlorophyll, which then degrades? Or does something happen to the chlorophyll that, in turn, triggers the leaf's death? Basically, which is the cause, and which is the effect? What condition or action defines the point of no return in plant leaves? What happens to a leaf's chlorophyll to make it change color from green to yellow? The leaf is yellow because it's Chorophyll is no longer present. What caused that? Old age, leaves have a limited life span. Not enough water or sunlight or a systemic failure in the plant. What condition or action defines the point of no return in plant leaves? What happens to a leaf's chlorophyll to make it change color from green to yellow? Because a plant uses capillary pressure to transport water. Not having water on a specific part of the leaf, will make the capillary effect weaker, to a point where no water can be transported. At this point cells will dry up, and will not be able to evaporate water anymore, which will cause structural damage to the plant. Chlorophyll is still there, but when it dries up, it turns yellow or brown (no longer functional). Plant death would be lack of circulation, or dehydration. Chlorophyll is still there, but when it dries up, it turns yellow or brown (no longer functional). Yes, my comparison with "brain death" was a poor choice ... I really meant death of a leaf. So, does the lack of chlorophyll kill a leaf, or does leaf death cause the destruction of chlorophyll? I've seen leaves wither from lack of water, but they can remain green. And yet, I've seen leaves turn yellow, and for a while at least, they seem to remain as plump and wholesome as a healthy leaf except that they have lost their green color. When the whole plant is under distress, it has to triage which leaves to sacrifice. Then it does it's best to salvage what it can from the sacrificed leaves before they lose enough water to make it impossible. Kind of like what happens when a tree goes dormant for the winter and you have to rake leaves like mad hoping it won't rain first. I got a tiny potted rose plant for valentines day which I forgot to water and and nearly killed. There wasn't a green leaf left, and the stems were brown and brittle, but I guess just enough life left in the roots or bottom of one stem to allow it to regenerate, but it really did look like toast and I almost threw it out. Drowning will also kill most plants, I think because this too stops circulation? Actually plants do not use capillary action. Water is transported from root to leaves via negative pressure which results from a draw created by the evapotransperation in the spongy mesophyll of the leaves, and assisted by the hydrogen bonds of the water and the interior surfaces of the xylem cells. Water and nutrients are transported to sites of need in the plant other then the leaves via positive pressure in the phloem, which is a source to sink transport and not capillary action.